Koh Rong Island is a beautiful and super fun island in Cambodia. Although a small island and still under developed, there are still heaps of fun things to do that could fill your days. Koh Rong is a laid back island, perfect to meet other backpackers and have a great time or even to do absolutely nothing. By night time, Koh Rong turns off their generators and all electricity goes out so it becomes a great detox from every day modern life! 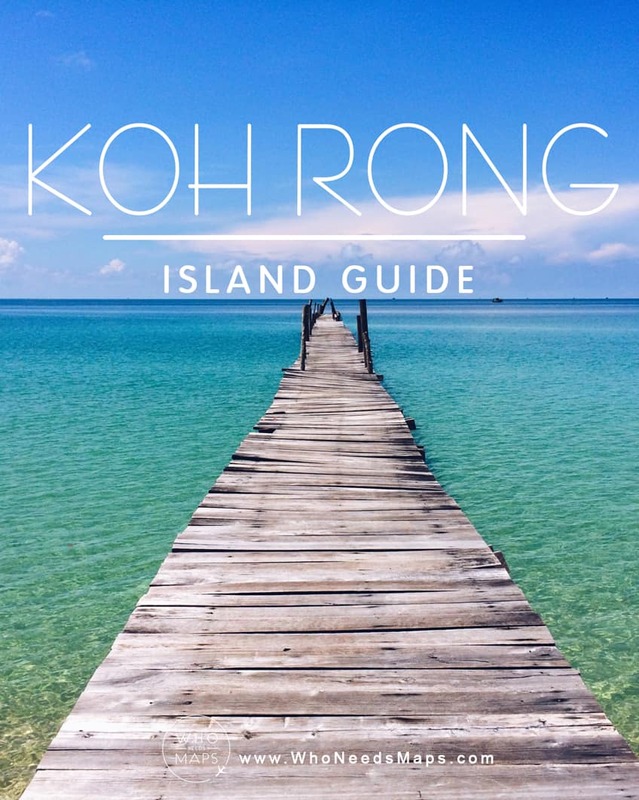 We would definitely name it as one of the top 10 places to visit in Southeast Asia and there is seriously so much to on the little island of Koh Rong Island! Koh Rong is only 25 Km off the coast from Sihanoukville. Getting there is pretty simple. There are 2 boats that take you to the islands (Koh Rong and Samloem); the slow boat ($5-10), and fast boat ($20). The slow boat takes about 2 and a half hours, while the fast boat takes less than an hour to get to Koh Rong Island. Many vendors and tour booths offer ferry trips there and back to Koh Rong and you can also book your tickets online. Make sure you plan ahead because each boat leaves about 2-3 times per day. Please note, for your own safety, boats may not leave when the tides and waters are rough. Bring food and water just in case you get hungry. Plus, it is always good to stay hydrated with the strong sun. If you get sea sick, motion sickness pills are always a good idea. The Long Beach hike (and beach) was one of our favorites in Southeast Asia. It is about a 45 minute hike through the forest until you reach the other side of the island to a desolate beach. The hike is a bit of challenge so wear good shoes and don’t forget any coconut oil to avoid any sandflies (man, those things are horrible). Try to go during the afternoon so you can make it for the sunset! You can get a boat back to the other side of Koh Rong, it costs about $5 for a full boat at peak hour and seriously so gorgeous! Because most electricity is cut off at night, Koh Rong has a super laid back night life filled with guitar playing, fire twirlers, story telling, and yes, an awesome BBQ. Koh Rong BBQ’s were $5 for any protein, sides and a beer- aka an awesome deal. Plus, they put on some fun music, there are communal tables to meet people, and the food is just sooo good! While we were there, they had massive movie screens set up to play the World Cup so it was there was an awesome vibe happening. Along the beach, there are a few nets set up to play beach volleyball. 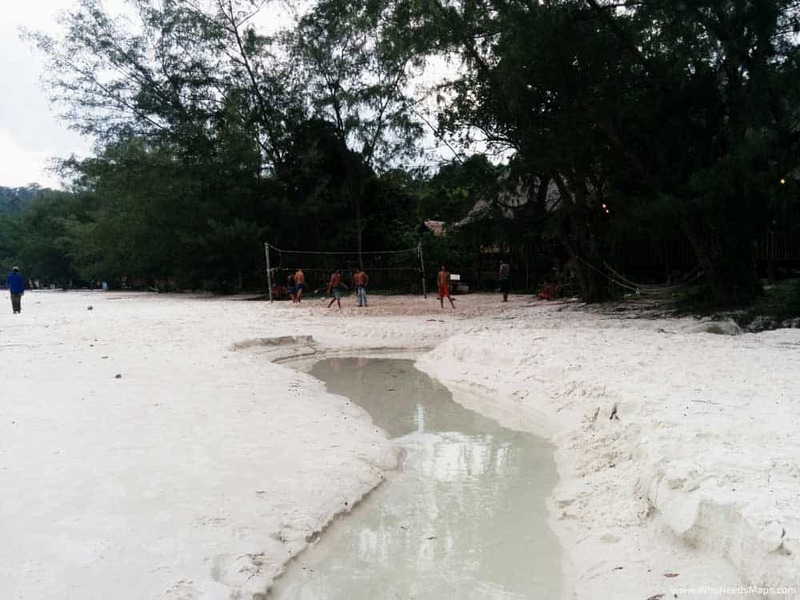 Most tour operators or hotels on the island usually carry a ball (for volleyball or soccer) so it is pretty easy to get a game going with a few other travelers on the island. So all you need is the ball, a few friends, and you are ready to have a fun (and small workout) on the beach! Apparently, when you take a swim at night, you can see the plankton in the water! They are these little blue specs of light that zip through past your face near some seaweed. Its best visibility with goggles, obviously, but if you are some type of crazy person (like Jack is) you can see them by keeping your eyes open in the ocean. Ask around the island, most people know the cool spots! It is definitely a phenomenon not to miss! When we say animals we mean the abundance of kittens and puppies! We know most of the animals on SEAsia beaches are a bit dirty and gross but the puppies and kittens in Koh Rong are usually owned by the hostels. They’re so cute! We were even waken up by 5 kittens in the Vagabond hostel. Uch, cutiessss! And we met a little puppy named Pancake! If you love little puppies and kittens (that are clean, for the most part), Koh Rong is for you! When you head off the dock, turn left, you will find some of the best Pad Thai (I’ll even say best food) on the island!! It is really easy to find, he just has a little kitchen outdoors with a big table outside. It is $2 for some Thai food that this sweet man from New York cooks up! It was the best value and we went back too many times. If you want a cheap, delicious food, this is the place to go! We didn’t do it, but we had friends who highly recommended it! It is apparently up a hill and in the mountains, where you zip line 12 courses along the forest. It might be around $25 to $30 for the day. It is definitely worth it to check it out if you want a cool adventure! We were in Koh Rong for a few days and stayed somewhere new each night. It gave us a taste of what was offered on the island and allowed us to meet all kinds of people! We traveled on a budget so we stayed in hostels, but there are some really magnificent hotels in Koh Rong to give you a taste of romance and relaxation from the island. Here are our favorite hotels in Koh Rong Island! 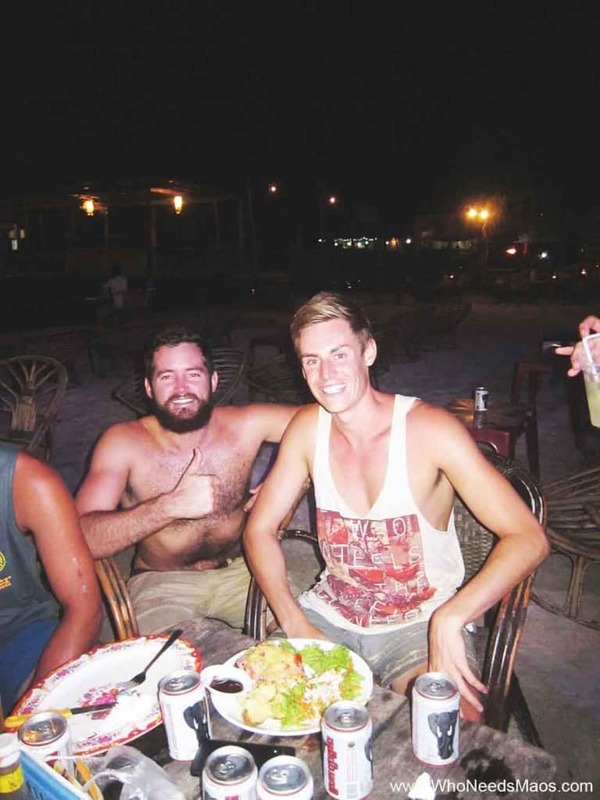 We stayed at Island Boys among others while we were in Koh Rong, but we suggest that you check out the accommodation and pricing list on TripAdvisor, the customer reviews are super helpful! Pura Vita Resort – If you want a relaxing and romantic getaway, Pura Vita Resort is the best choice. With your own personal bungalow, you will be located on the south coast of Koh Rong, right on Sonaya Beach. With 4 kilometers of private beach and crystal clear water, you will not find a better location! There are plenty of activities and tours around the hotel! The bungalows cost about $23-$43 a night. TreeHouse Bungalow Resort– Just around the corner of the main stretch of Koh Rong Island, lies a quite part of the city with tree houses. And yes, these tree houses are a special option to sleep in! You get to sleep in a tree (how awesome! ), have an unreal ocean view, and feel like you are completely in the wild (despite having a bed and a shower…). A nights stay costs about $35 per night. – Please note that electricity is quite limited on the island. It goes on from 5:30 pm to 11:00 pm and then it turns off. Charge your power bank during this time that way you don’t have to worry much about charging all the other stuff over night! – Bring coconut oil or something with a whole heap of DEET!!! Those sandflies are relentless and they give the worst itching feeling ever. Just be cautious of sandflies and protect yourself from all the insects. Don’t say we didn’t warn you!! – Bring enough money to last for your stay because there are no ATM’s on the island. Bring cash, but be careful where you keep it because there isn’t much safety on the island. Don’t fall for their fast cash system, aka giving your passport, they give you money, and then you collect your passport back on Sihanoukville once you pay them back. Ya, no chance of giving up our passports! Be safe, bring enough cash, and protect your values. – Don’t listen to the guys on the boat for their recommendations for the cheapest room. The guys who run the boats from Sihanoukville to Koh Rong own a few of those places and claim to be the cheapest and best. We found cheaper and better!… we also heard those rooms have bed bugs…We also hostel hopped because we wanted to try new places with different vibes! – Because this is a pretty remote island, be careful where you check in because we heard of a few people who had bed bugs. Sleep on a sleeping liner or opt for a pricier hostel (We’re talkin’ $5 a night!). If the bed bugs get into your clothes, than you have a big problem on future travels. – Bring a first aid kit because there aren’t many pharmacies on this Island. The nearest hospital would be on Sihanoukville, a bit of a boat ride out! Be prepared with band aids, scar cream, sunscreen, aloe vera, and disinfectant. It is better to be paranoid and safe, than sorry! Have you been to Koh Rong Island? Tell us about it! I lived and worked for Dave at Vagabonds on the island who also ownded Island Boys about 2-3 years ago now, I managed to stay for just under a month with a sweet deal to work in return for free food, booze and somewhere to stay (not to mention the free weed). Koh Rong worked in a beautiful harmony between travellers that have decided to stay and the local people who accommodated for them. There was a strong working relationship between the local Cambodians and the western tourists. I really loved Koh Rong, even though it was the closest thing to paradise and sometimes felt like a dream it did come with sometimes un-sanitary conditions and a shed load of dangerous animals and insects. For anyone that is thinking of going there, the best advice I’d give would be talk to everyone who runs a business and try and get a feel for the community but also come prepared to not want to leave as well! Oh and if you haven’t met a sand fly yet, good luck my friends. oh those sandflies are the WORST!!! but Koh Rong is still fantastic! 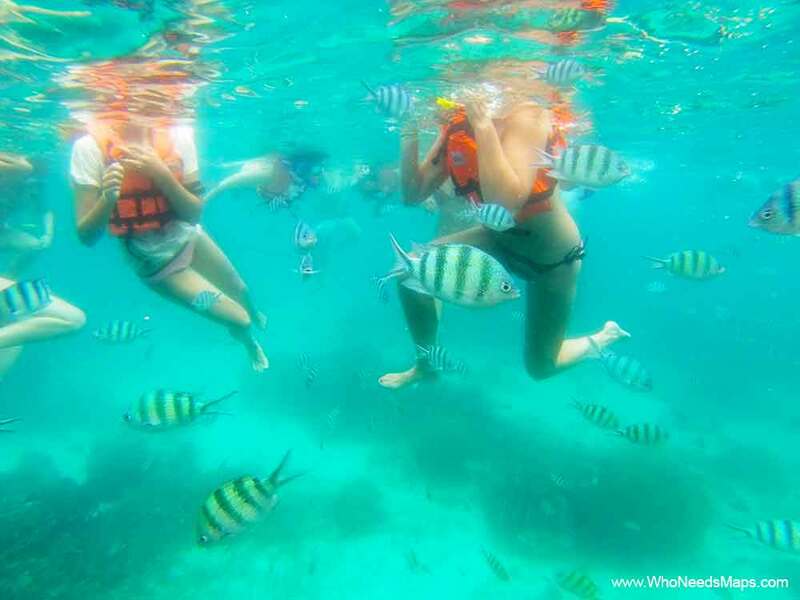 Hello, thank you, great blog, I really want to go to Koh Rong, can you compare to Thailand ? Less crowded ? Very nice but no internet and electricity ? I loved Koh Rong, I think it was quieter and less expensive than Thailand (or at least in certain places). Theres not much electricity at night but it is definitely a place to visit! It is really fun and there is so much to explore. Hope you have a great time! Long Beach is one of the prettiest beaches ive ever seen! And OMG i totally forgot about the sandflies, but thy were aweful!